The task of finding rabbit safe foods your bunny can eat can definitely require research! It is so vital to only feed your bunny rabbit safe foods to avoid weight gain and digestive upset. In this article, we will feature 20 rabbit safe foods that you can add to your rabbit diet with confidence! Here is the list of each of the rabbit safe foods so you can head right to the food you want to learn more about! So what do bunnies eat in the wild? As it turns out, wild rabbits eat mostly greens. In fact, a rabbit is a “herbivore” – a plant eater. Rabbits will seek out the freshest greens, which can include grasses, herbs, weeds, clover and others. The list of what do wild rabbits eat can also include tree bark, although they prefer fresh green foods with a high nitrogen and water content. 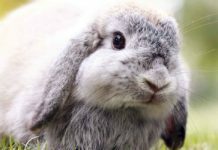 Of course, in a domestic setting, your pet rabbit will already have plenty of fresh water to drink and so won’t need to seek out rabbit safe foods with a higher water content. Pet rabbits require a balanced commercial food pellet, along with hay and fresh foods. Dried: a variety of dried grasses and hay should always be available. Fresh: 75 percent leafy greens, 15 percent other veggies, 10 percent fruits. So now let’s take a look at some rabbit safe foods that can add flavor, variety and fun to your rabbit’s daily menu! The short answer to this question is that yes, rabbits can eat apples. The longer answer is that it is only safe to feed your rabbit the apple flesh and NOT the seeds or stems. It is also safer to peel the apple or wash it very well if you want to offer it with peel on. Apples, like most fruits, are quite high in sugar, which can pack on the pounds quickly. So only offer apples in very small quantities occasionally. Asparagus is kind of an ideal treat food for rabbits. It is low in calcium and high in water/fiber content. There are two important things to think about when offering asparagus: first, be sure to balance out this high-water treat with low-water veggies to avoid digestive upset. Second, you may want to offer cooked asparagus or just the raw tops to young rabbits. Rabbits love bananas just like people do. What’s not to love – bananas are delicious! Unfortunately for rabbits, the high sugar content in fruits basically means they should only be offered as an occasional treat food. Bananas in particular have lots of sugar, which can cause weight gain if fed too frequently. Rabbits can eat blackberries safely. In fact, blackberries are natural astringents, which can help tighten blood vessels and heal wounds along with easing G.I. issues like diarrhea. Wild rabbits often show a preference for eating berry plants, including leaves and bark along with the ripe berries. As another side benefit, blackberries are lower in sugar than many other fruit treats, making them suitable to feed slightly more often. Broccoli is a great addition to your rabbit’s regular fresh food menu. Broccoli is low in sugar and high in dietary fiber. It also contains lots of vitamins and minerals. 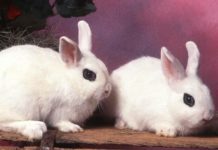 Very young rabbits should be offered the softer florets, while adult rabbits can be offered both florets and broccoli stalks. 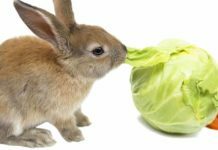 Cabbage can be a great source of leafy greens for a pet rabbit. The darker green cabbage varieties have the most nutrients, although you can also feed white and red cabbage occasionally. However, before loading your rabbit down with cabbage leaves, keep in mind that it can be a bit hard to digest! So start out offering very small quantities. 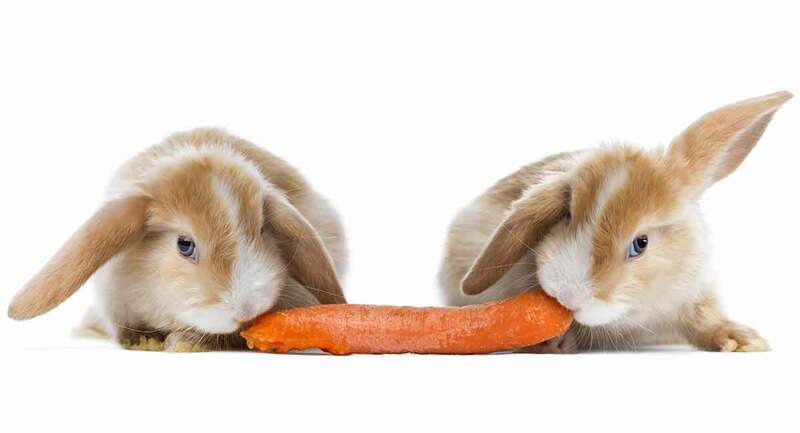 Out of all the fresh foods rabbits can eat, carrots probably cause more confusion than the rest combined! Bunnies love carrots, and this makes it hard to resist offering them frequently. But your rabbit will fare best health-wise if you only offer these high sugar, high starch “natural candies” occasionally. Cauliflower may not look like the healthiest fresh food for rabbits but it is actually quite nutritious! Cauliflower does have a very high water content, but it also has a high fiber and nutrient content to balance that out. However, cauliflower may cause bloat and gas, so small amounts only should be fed. Celery is not a food a wild rabbit would likely encounter. However, this stringy veggie can be a healthy addition to your bunny’s fresh foods menu. The safest way to feed celery is to de-string it and chop it into small bits. Cilantro is a safe addition to your rabbit’s regular menu of fresh leafy greens. Just be sure you wash the plant thoroughly to remove any pesticides and feed it when it is very fresh. Cilantro is a medicinal herb that can help keep the G.I. tract healthy, reduces gas and bloating and eases upset tummy. Plus, rabbits seem to love it! Cucumber is safe for your rabbit to consume in minimal quantities. It is best fed during the hot summer months since it is so high in water. The most nutritious part of the cucumber is the outer skin, so be sure to wash the cucumber well or buy organic (which will be pesticide-free). Rabbits can eat grapes, and if your pet rabbit is like most rabbits, grapes will likely be an instant hit! But it is important to remember that grapes are both high in sugar and high in water, neither of which is ideal for rabbit food. It is fine to offer green, red or purple grapes – well washed, of course – as a very occasional fruit treat. Green beans can be a good supplement to your rabbit’s regular fresh greens menu. Green beans have plenty of vitamins and nutrients along with their satisfying crunch. As a bonus, most rabbits really like green beans! But since these fibrous veggies can be challenging to chew and digest, be sure to start very slowly to avoid gas, bloating or diarrhea. Rabbits can and do safely eat many herbs that humans also eat, including basil, mint, dill, sage, rosemary, thyme, coriander and others. You can safely add very small quantities of these dark leafy greens to your rabbit’s fresh greens rotation. Can rabbits eat lettuce? Can rabbits eat kale? Leafy greens make up an important part of your pet rabbit’s daily fresh food diet. But be sure to rotate the type of lettuce for balanced nutrition. Steer clear of light-leaf varietals like iceberg which are high in water and low in nutrients. Romaine lettuce, dandelion greens, kale (in moderation), dark leafy lettuce, mustard greens and similar nutrient-rich darker leafy greens are safe to feed in moderation. Oranges are really tasty, and rabbits do tend to like them. But they should be fed in very strict moderation to avoid digestive upset or weight gain from the high sugar content. You can offer one-half or one wedge of an orange, tangerine or mandarin orange safely every now and again for training or treat time. Squash can include pumpkin, zucchini squash, butternut squash, yellow squash and other varietals. The various squash types are each high in vitamins and minerals but can be higher in starch and sugar as well, making them more suitable to offer as an occasional seasonal treat. Rabbits can safely eat both strawberry fruits and the strawberry leaves, branches and stalks. Strawberries are also lower in sugar than many other fruits and are one type of fruit a wild rabbit might occasionally come across. Ripe tomatoes of any color (red, yellow, purple) are safe to offer your rabbit in moderation. But green tomatoes and tomato leaves are toxic and should never be offered. Also remember that, technically, tomatoes are fruits, and they are high in water and sugar. So keep portion sizes quite small to avoid digestive upset or weight gain. Zucchini, ideally raw, can be a tasty addition to your rabbit’s weekly diet. Zucchini has plenty of vitamins and minerals, including potassium, which can support central nervous system function. While we have listed 20 great foods for bunnies, there are others they can eat, too. For example, can rabbits eat peppers? Can rabbits eat radishes? Can rabbits eat watermelon? In all these cases – yes! But remove the seeds on fruits like watermelon. If there are more you want to know about, tell us in the comments! 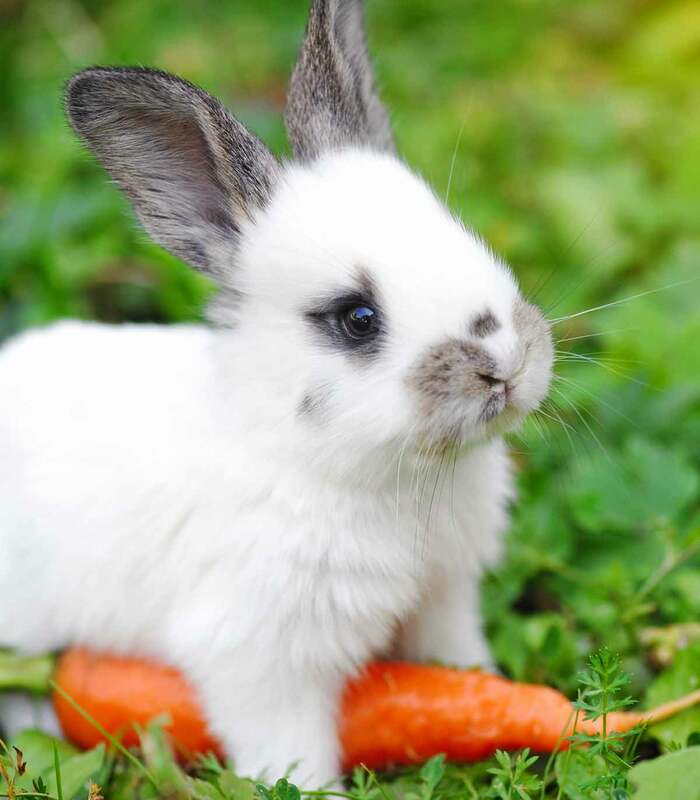 We hope you have found this article about the best rabbit safe foods helpful to plan out your sweet bunny’s weekly menu! Martin, A. et al (2018). Suggested vegetables and fruits for a rabbit diet. House Rabbit Society Rescue. May, B (2017). What herbs can rabbits eat? Countryside Daily. Block, K., et al (2017). Rabbits and vegetables. The Humane Society of the United States. Axelson, R. (2018). Rabbits and feeding. VCA Animal Hospital. Dacombe, A. (2013). Feeding rabbits. Veterinary Centre.